Today, the image of John F. Kennedy is so prevalent and familiar that the man himself almost recedes into myth. He stares wisely from coins, commemorative plates, coffee mugs and other collectibles. The mystery of his murder is replayed again and again on television, in movies, on conspiracy websites and on major anniversaries of the assassination. But Lawrence Schiller wanted people to remember the real JFK, in the context in which America’s 35th president was pictured in his own time—untouched as yet by the mists of mythology and the dream of a vanished Camelot that would come later. The result was a book, JFK: A Vision for America, and an accompanying exhibition curated by Schiller, “American Visionary: John F. Kennedy’s Life and Times,” which opened in 2017 at the Smithsonian American Art Museum and went on to the New York Historical Society. The exhibition travels next to Santa Ana’s Bowers Museum of Cultural Art, where it runs March 10 through June 8. Schiller, a working photojournalist in the 1950s and 1960s for publications such as Life, Saturday Evening Post and Paris Match, is perhaps best-known for his photographs of Marilyn Monroe taken in the early 1960s, and for his collaborations with Norman Mailer, who was a close friend. He went on to direct and produce motion pictures and miniseries for television, including Emmy winners The Executioner’s Song and Peter the Great. “As a journalist, I was on-scene at many of the great events that helped shape the world we live in today. I was in Dallas when JFK was assassinated, and I was with Robert Kennedy covering what would turn out to be the final 30 days of RFK’s life,” said Schiller, 81, in a phone interview from New York City, where he was preparing for the opening of a new exhibition he curated on RFK and Martin Luther King, Jr. When Jean Kennedy Smith, the last surviving sibling of JFK, and her son Stephen decided to get involved in the centennial commemoration of JFK’s birth, they looked for “someone who could present Kennedy in a contemporary manner,” Schiller recalled. He was chosen for the task. Photographers and news cameramen of the era portrayed the charismatic JFK and his fashionable wife, Jackie, as symbols of a new, youthful era in America—one of both sophistication and hope. And Kennedy himself enthusiastically partnered with the media to help build public support for his projects: The space program, legislation on civil rights and immigration, federal health insurance for the elderly and more. The scope of Kennedy’s dramatic life plays out in the exhibition’s more than 70 photographs, which follow him from his first congressional bid as a decorated war hero in 1946 to his run for the White House in 1960 to the national tragedy of his death in Dallas in 1963. The John F. Kennedy exhibition is produced by WS Productions in association with the John F. Kennedy Presidential Library. 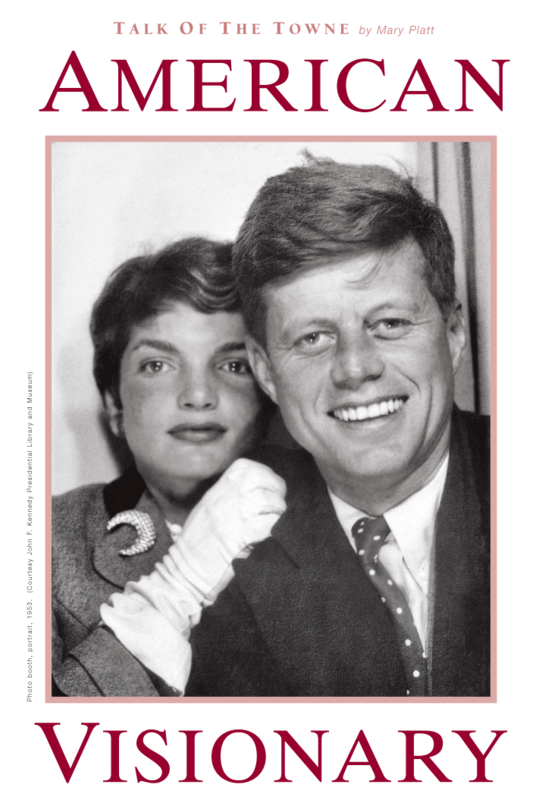 AMERICAN VISIONARY: John F. Kennedy’s Life and Times at the Bowers Museum of Cultural Art runs March 10 through June 3. Tickets available at the museum or online at www.bowers.org. Open Tuesday-Sunday, 10 am to 4 pm. Information: 714-567-3600. Written by Mary Platt, Photograph used by permission only.